Winter is beginning. Leaves are still drifting down to texture the forest floor with fascinating designs. Looking down we can find a lot more than just brown leaves.Oddly blotched green leaves appear in patches here and there only in winter. These are cranefly orchid leaves and the leaf reverse is a dramatic purple. Look closely and you can see small seed pods still attached to a dried stem. The pods are dry and splitting to release their tiny seeds on the ground amid the oak leaves. 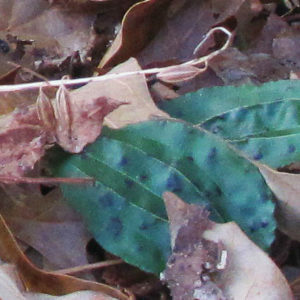 The oak leaves will have to provide a fungus for the immature orchid seeds to germinate. These delicate plants will flower in mid-summer with mosquito-sized miniature orchids along a tall stem when these green leaves have long gone. 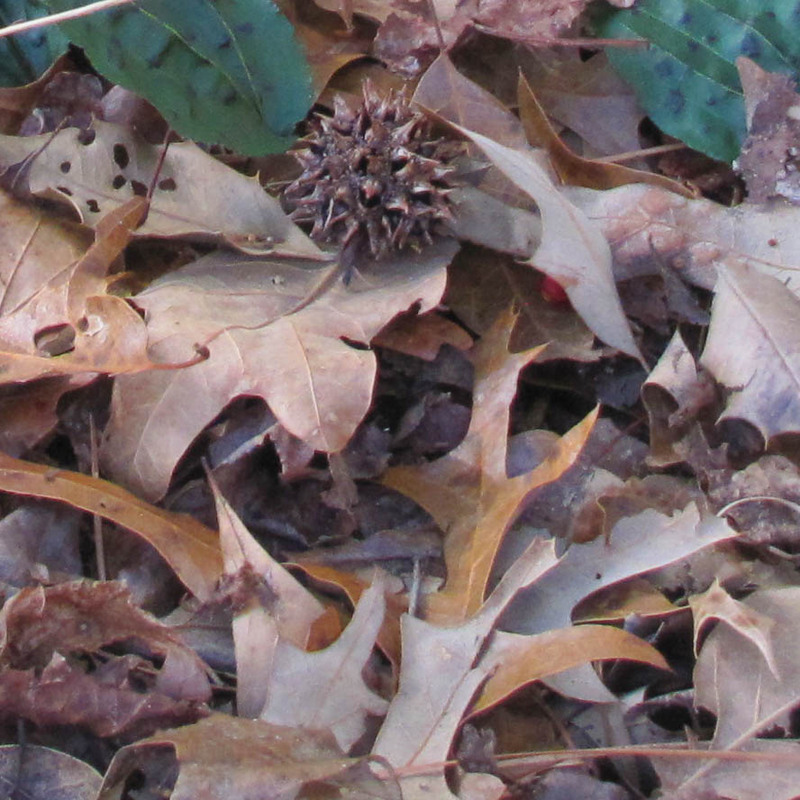 Looking down can be an entertaining puzzle to identify the various shapes of leaves and forest clutter. A round spiky ball holds seeds from the Sweet Gum tree and a small red berry is attached to a partridge-berry vine. Crumpled, chewed and sculptural leaves can be identified as pin oaks, holly, white and red oaks and sweet gum. Take a walk along a nature trail in winter and there is a lot to see, even when just looking down!